Ready for some motivation to plant your fall garden? I know I am! 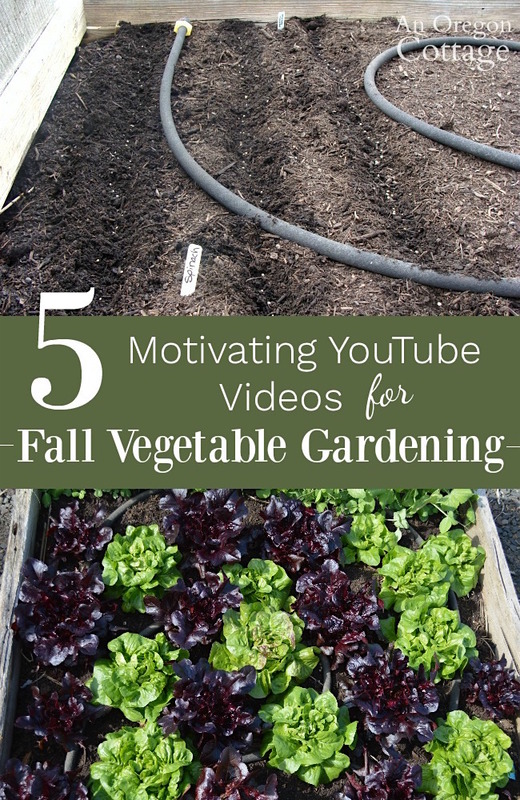 Check out these 15-minute-or-less videos for great fall gardening ideas & vegetable tips. Do you live in an area where you can grow a fall garden? According to the chart here, most zones in the US could plant something to harvest in the fall. Even areas that get a first frost in early September could plant lettuce and radishes at the end of July and still eat salad into fall. And maybe longer with covers and season extenders. I go into detailed tips to plan and plant a fall vegetable garden here, but we all need a shove gentle nudge to get us out of the summer-watering-just-trying-to-keep-everything-under-control cycle and remind us to plant a few seeds for fall. Right? I mean, I’m right there with you! I forget in the heat of July that it’s planting time, too. I need to remember better what I feel in October – how I wish I had more lettuce, spinach, or cabbages to harvest in the cool of fall. With that in mind, I headed over to YouTube to see if I could find any good videos with fall gardening ideas, vegetable varieties to plant, and any tips. What I found was a ton of inspiration! The gardeners in the videos reminded me why I like to have something other than tomatoes in the fall. And that great feeling when you’re still picking from your garden in November. And of course I wanted to share the videos I liked best with you! There weren’t a ton that were just for fall – and some where way too long – but I pulled five of the best to show you here. The other great thing? The gardens shown are from all parts of the US, which illustrates that fall gardening is for everyone! This video from MIgardener is the longest at just under 15 minutes, but he’s got a lot of good information and an enthusiastic attitude. Plus he gives some specific seed varieties to plant for fall gardens as well as other preparation tips. You may want to check out his other videos – I especially like his “core gardening” technique for raised beds to reduce watering. I’m definitely going to try this soon! This GrowVeg video is basically a four minute slide show, but it’s packed with information (and a nice British accent voice over) for fall gardening, including frost dates and varieties. There is also some good information about succession planting throughout your entire growing season. I especially liked the varietal grouping concept – it makes it really clear about what you can plant and when. One of the shortest at just over three minutes, this video nevertheless is chock full of good information. You’ll see how and what to plant, how to shade the seeds, and more. I also just loved the raised bed garden we see here – the beds are tall and the gardener hardly has to bend over to plant! There are also some really interesting-looking permanent structures that can hold shade and row covers when needed. It also looks like they provide support to tomatoes and other tall plants. Cool stuff. I really liked the approachable gardener in this video. She lives in one of the US’s most northern states and still is enthusiastic about fall gardening – I love that. She also has some good ideas about harvesting for sweetness and shows a vegetable I hadn’t heard of before – a cross between kale and brussels sprouts! If your microclimate is windy at all, you’ll want to check this out for her planting tip in the heat of summer. As a garden tour, this falls firmly into the inspiring category. And wow, is this garden lovely! But this quick three-and-a-half minute video is more than just pretty – it also gives lots of ideas of the types of vegetables you can grow to ripen in the fall. Have your list ready to write down some of the ideas for fall garden vegetables he gives. Inspired yet? I’d love to know what you’re doing for the fall – let me know in the comments, and especially if you have any good varieties you love for fall gardening!